People Archives - 45 Conversations Media & Education Ltd. 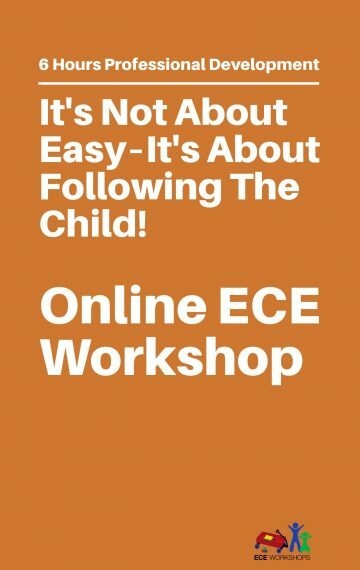 I recently placed a deck on Slideshare about building relationships online. It’s always about the people – not the tools. I smiled when this tweet from Jeff Emmerson crossed my Twitter stream this morning. I’ve been watching Jeff’s work with interest for quite some time now; especially since I’m an adult with ADHD myself. In the day to day busy moments that happen in our lives it can be so easy to simply go through the moments and motions. Jeff”s tweet serves as an excellent reminder that above all else – it’s always about people – AND relationships. How right he is! 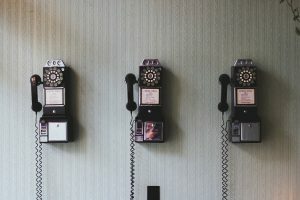 Over the years I have written a number of different posts about people, relationships and connections. They all matter to me. Despite being an introvert; I love getting to know people, learning about what matters to them and building relationships with folks whose interests and values are aligned with mine. Helping others share their voice means everything to me. These are just a few of the reasons that I’m so invested in communities like #GeniusShared and #MisfitCon. 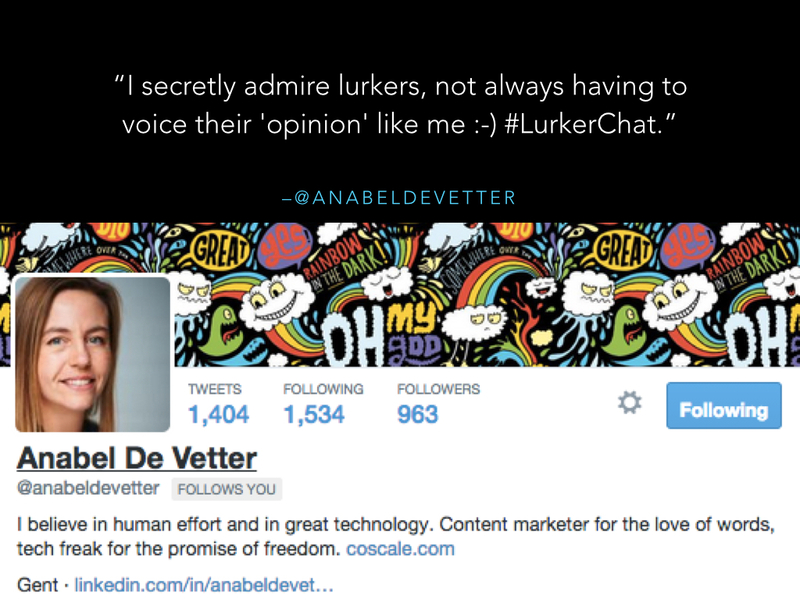 It’s also why I’m beyond thrilled to be conspiring with Nick Kellet on #LurkerChat. I do all of this every day – with generosity and intention as my guide. So as we enter this busy holiday season and move toward 2015 remember that it’s the relationships that you build that lead to everything else. People matter. Individual people. Everything flows from there. Love, laughter, compassion and yes – business. 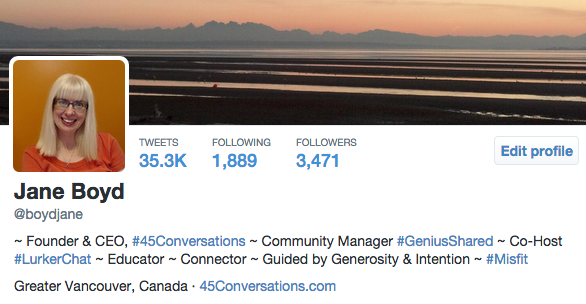 Here are some tips to help you build relationships with the people behind the tweets in your Twitter stream. Find and follow people whose values, work and passions align with yours. Begin to engage with individuals who interest you by commenting, tweeting questions, thoughts and feedback. Enter into a conversations with them. Invest in those conversations over the long term. Think long term – not quick hits. Don’t expect people to “give or lend” you their influence – just because you ask for it. Your asks should be in line with the relationship you have built. Take the time to read a person’s Twitter bio. Check out their website or blog. Read what they are writing about. Look for their comments and work across the web. Learn their style, tone and thought patterns. Get to know them. Listen. Where possible, meet in real life or at least via Skype or Hangout. Even the most informal chats are an opportunity to begin building and investing in a relationship. Attend conferences, meetups, tweetups and other events that will give you a chance to meet and get to know people individually. Think “give” – not “get”. It is as simple as that. Don’t approach relationship building from the place of what you need, want or how quickly you can gain something. 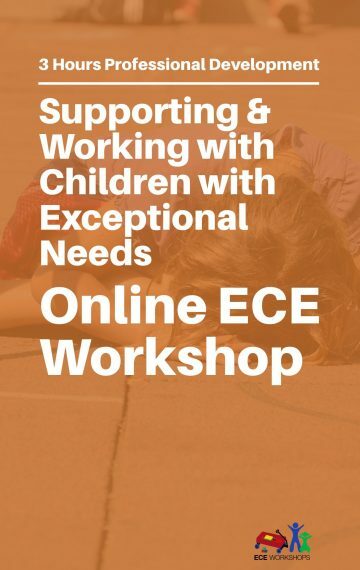 Look at what you can offer and how you can help the other person out. The old adage “it is better to give than receive” applies here – every time. 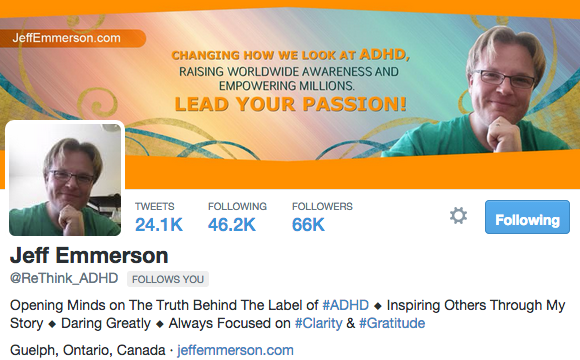 So thank you Jeff Emerson for tweeting me your thoughts today. They mattered a lot to me. I appreciate you and your important work. So yes, let’s build a relationship first! 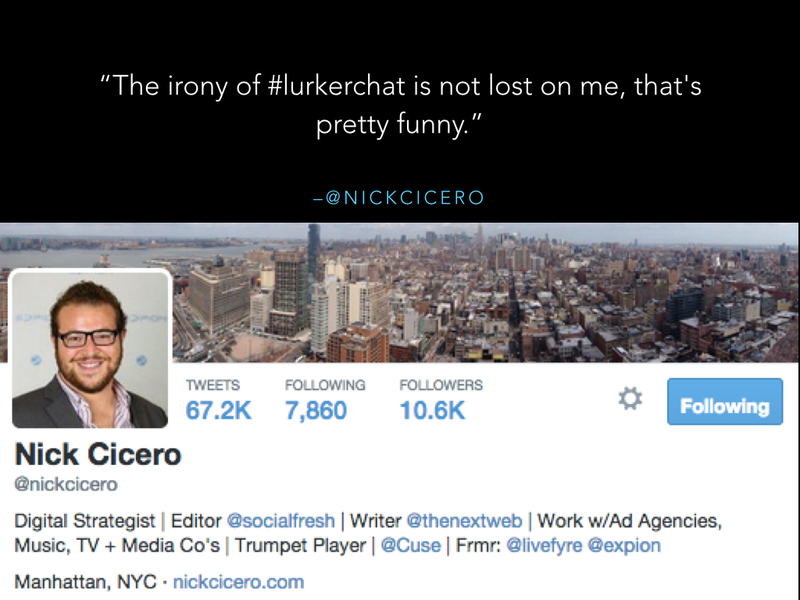 Nick Kellet and I were delighted to host the second week of #Lurkerchat yesterday morning. 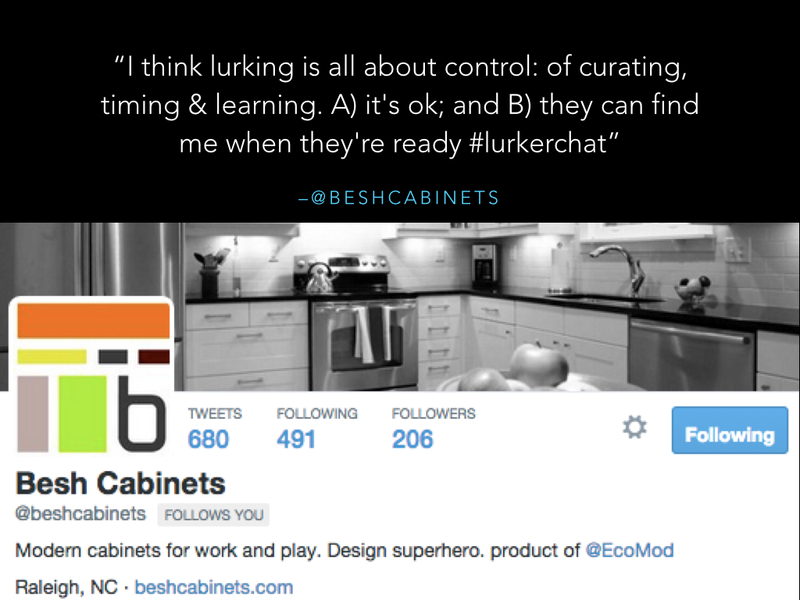 We came up with the idea for #Lurkerchat after spending a lot of time discussing those who choose to lurk on social media. Nick and I both embrace the idea of generosity in business and in the online space. 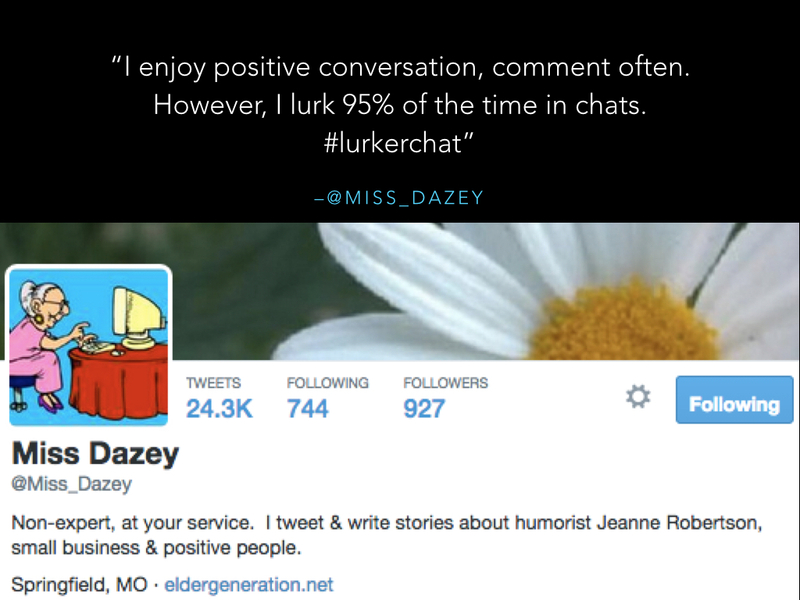 Starting #Lurkerchat seemed like a natural extension of the things we each do on a daily basis. On this week’s #Lurkerchat we had 40 folks join in over the time that the chat ran (Tuesday’s at 10:00 AM Pacific for an hour) and we really enjoyed hearing all of the different perspectives. The week earlier we had about 29 folks show up; so having the additional people share their thoughts during this week’s chat was excellent. I went back through this week’s tweets and there were a few that stood out. Clearly there are a lot of thoughts on lurking. 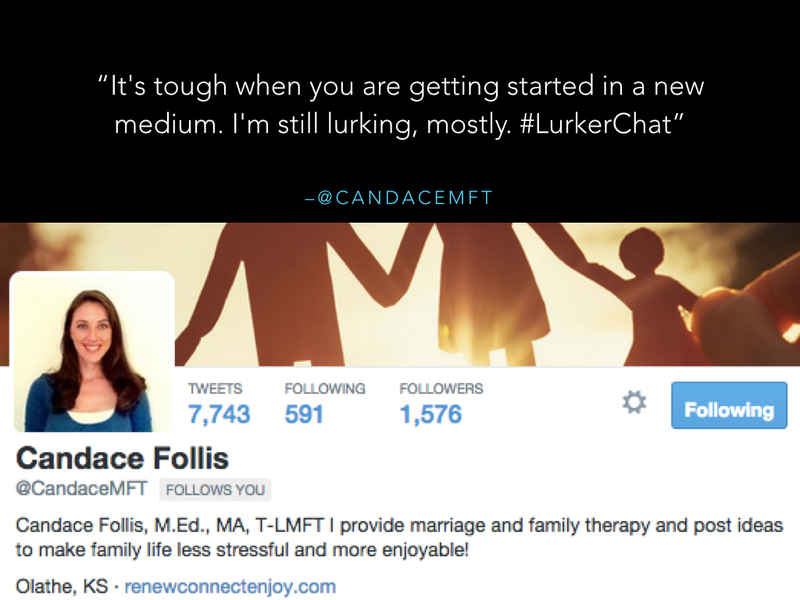 There is a lot to learn about lurkers and lurking. 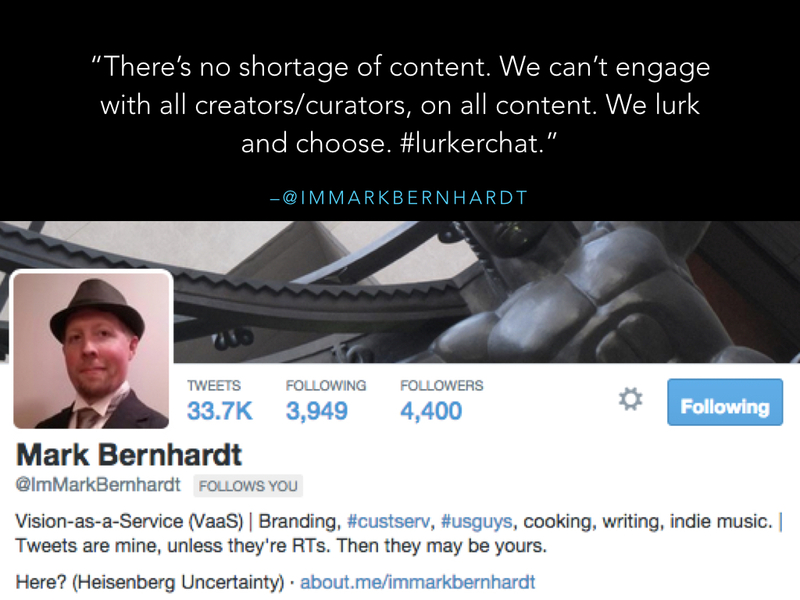 #Lurkerchat is an experiment. We are exploring a topic that many don’t speak about. We are asking folks to step out from the shadows and tell us they are there. We are asking those who are quiet to engage. We think people’s voices matter. 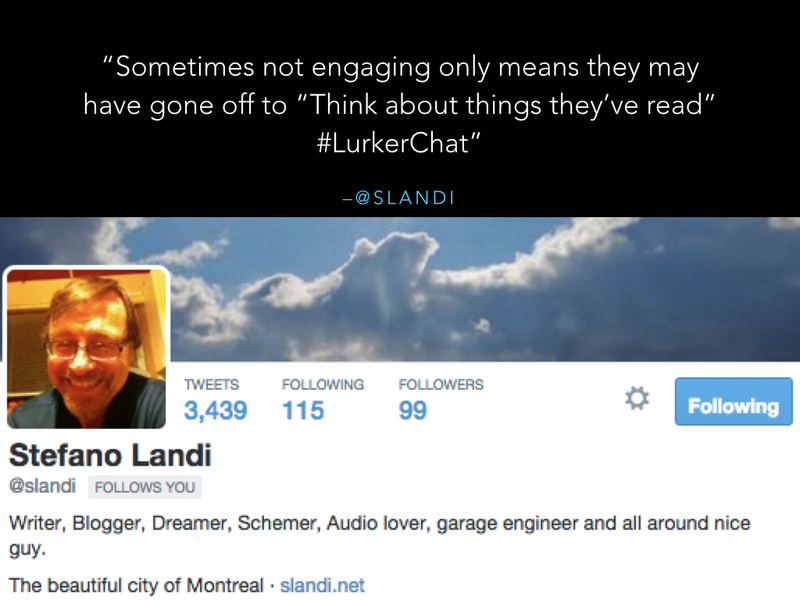 And we want to hear them every week during #Lurkerchat.